Have you been looking around your kitchen lately and thinking it needs a little something extra? Maybe renovation isn’t quite in the budget yet. Maybe you just painted your walls and cabinets with a sleek new color. Your kitchen is in great shape, but it could use some freshening up. 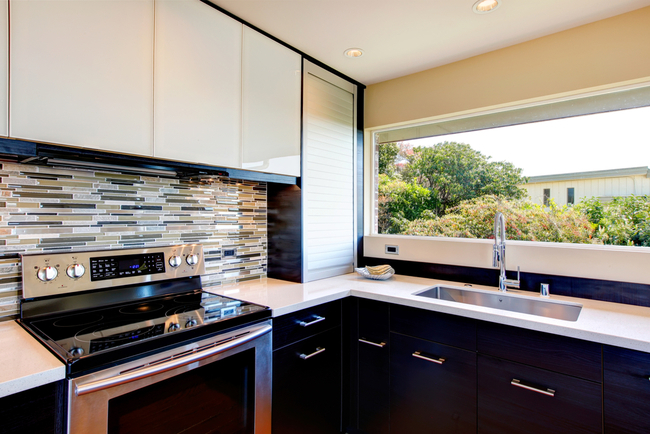 Have you thought about your backsplash lately? The portions of wall beneath your cabinets are sometimes overlooked, but they can quickly become an attractive addition to your kitchen design. They don’t take up much space, and they can make a world of difference in terms of visual appeal! Don’t believe us? Check out this gallery of creative kitchen backsplash designs! 1-Painted backsplashes. Painting your backsplash is one of the most popular traditional options, and is by no means a fallback option. Because your backsplash doesn’t occupy much wall space, you can afford to go bold with your color choice. Consider opting for a strong accent that highlights a color scheme in your kitchen. 2-Stone tile backsplashes. Using stone tile creates an attractive mosaic effect. Rather than boasting a single solid color, they can help you accentuate several subtler colors in a way that breaks up the wall space. When you opt for real stone, the difference in texture and dimension is hard to beat! 3-Metal tile backsplashes. Aluminum, copper, tin, and brushed steel have a lot to offer in terms of stylistic choice. They typically come in squares or adhesive tiles, with a range of options including punched-in patterns or brushed, finished metal. Because of the variety, these tiles can suit both rustic and ultra-modern aesthetics. 4-Peel and stick backsplashes. Peel and stick backsplashes are growing rapidly in popularity. Before you write them off as tacky or unusual, take a look at a few beautiful adhesive backsplashes. At a much lower cost than other options, and without any renovation required, you can achieve almost any look, pattern, or design you’d like. Need Your Kitchen Remodeled in the DC Metro Area? At Stohlman & Kilner, we offer a full range of interior remodeling services. From kitchen cabinet painting and installation, to backsplashes, to complete renovation, our experts can do it all. Get in touch with us today to discuss your kitchen remodeling needs!